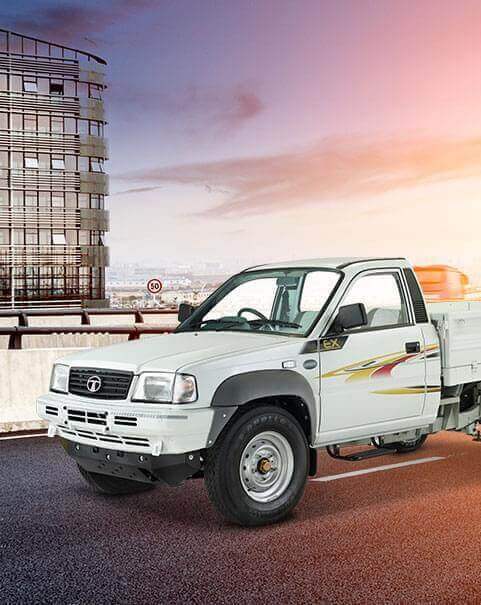 "TATA 207, Ex & Rx Features - Performance | Mileage | Loading Capacity etc." The 207 Rx Pickup comes with a 6 leaf Front Leaf Spring suspension and two stage, 9 leaf Semi Elliptical Leaf Spring suspensions at the rear for added robustness. Strong aggregates like a Salisbury axle, 4 mm thick chassis and 16' radial tyres make it a highly stable vehicle ideal for milk, poultry and fruits/vegetable transportation. Assisting in this are also it's smaller turning circle diameter for ease of manoeuvring, high ground clearance to negotiate rough roads and a design that aids in better driver visibility. 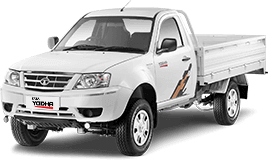 Higher profitability: The 207 Rx Pickup has best ground clearance of 210 mm which ensures better manoeuvring in off road applications. The load body is best is class and allows for higher profitability per trip. Better mileage: With Common rail technology in BS 4 & high flat torque curve advantage, customers will get best in class mileage. Low maintenance costs: The 207 Rx Pickup gives lowest in class maintenance costs with service interval of 20,000 Km and a standard warranty of 3 years/3 lakh kms on complete drive line which are valid even in case of transfer of ownership. High on Comfort: The 207 Rx Pickup promises great cabin comfort with power steering, an adjustable steering column and comfortable seats for a restful drive experience. The 207 Rx Pickup up gives SMART Performance with a 4SP Turbocharged common rail engine that churns out 63.4 kW 85Hp Power for better pickup and 250 Nm of Torque at a band of 1000 - 2000 r/min for better pull. The latest common rail technology makes it a quiet performer with low N-V-H (Noise - Vibration - Harshness) and best mileage with 80 Kmph max speed (0 to 60 in 16 sec.) for quick turnaround time.